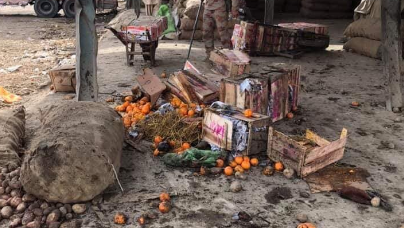 Islamabad, April 14: The Islamic State (IS) has claimed responsibility for the suicide attack at a vegetable and fruit market in Pakistan's city of Quetta. The militant group said in a statement on Saturday that one of its members carried out the suicide attack that killed and injured several Shiite community members and Pakistani troops, Xinhua reported. There was no official confirmation from the Pakistani side yet. Pakistan: 16 Dead, 30 Injured in Blast at Hazarganji Sabzi Mandi in Quetta. Shortly after the attack, the Hazara community members including women and children staged a sit-in which continued on Saturday, demanding better security measures from the government. The protesters demand that the government implement an effective security plan and ensure protection of the community. Bomb Blast in Pakistan Kills 14 People at a Fruit Market in Quetta.